He was bright and acerbic and always well dressed whenever I met him. A great loss to the movement and to the world. Totally choked to hear this news. and (more importantly) a person of their word. My condolences to everyone who knew him. I'd bet that there weren't many who, like Alan, had the courage to give up nationalism for libertarian communism and go on to organize in the difficult circumstances of 1970s Ireland. This is indeed sad news. I had the pleasure of being put up at Alan's in the 1980s. Condolences to his family, comrades and friends. Alan MacSimoin presente. Very sorry to hear this. He was a top man. I never felt he was defined by his differences in opinion with others. A strike a McDonalds.... the struggle never ends, even as comrades lives do. ["b]Anarchist Worker,[/b] published by the Anarchist Workers Alliance in the late 1970s/early 1980s, can be regarded as one of the forerunners of the Workers Solidarity Movement. The AWA existed in Belfast and Dublin but was always more of an idea than a reality, with membership never going into double figures. The print run was about 750 (ranging from 500 to 1,500)." I'm very saddened to hear this. I'm sure we had a disagreement or two, and I'm sure he was probably right. He was a wonderful servant to anarchism. 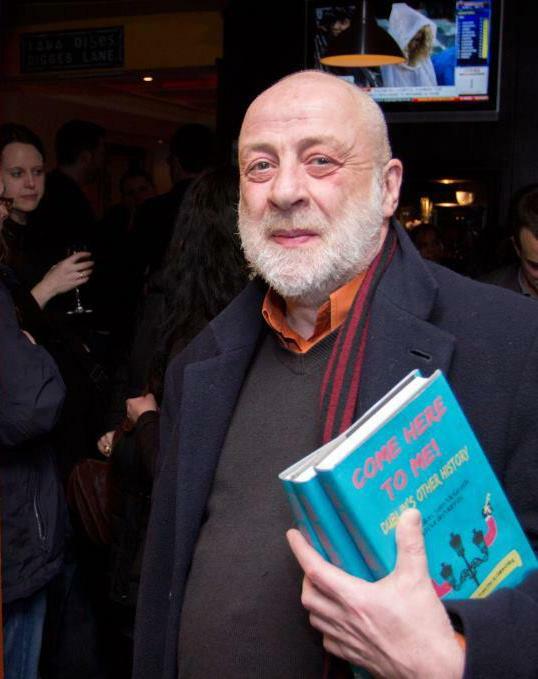 Alan at launch of Come Here To Me! book 1 in December 2012. Credit – Paul Reynolds (lifted from Come Here To Me). I remember around that time a night time torch-lit march in London for the Murrays led by a wailing bagpiper. Cool,cool, I never knew about his London participation in the Murray ca,pain. I recall that issue of the "AW". I somehow remember (falsely maybe at this time) that the Murray page was also a stand alone leaflet or something of sorts. I know we did our best to publicize the Murray case, do defense stuff and disbursed stuff from the defense committee, Also recall a smallish leaflet, one sided by the DC which we made copies of and distributed. Not having access to our records at the moment, I'm wonder if it was thru the Murray case we first were in touch with Alan? Oddly, I also remembering him signing his name as Alain (is that gaelic? ).